Bulgaria is a relatively small country with an area of only 111 000 square km. Even still one third of the territory is mountainous covered by approximately 40 mountains. Each one of them is unique with its specific relief, nature, flora and fauna. Bulgaria is also home to three national parks – Rila, Central Balkan and Pirin National Park. Pirin National Park is not the biggest, but it is certainly the most adventurous and thrilling to explore. The park offers numerous hiking routes with different difficultly levels. Regardless if you are a professional climber or just an amateur hiker, there is something for everyone. This summer I spent a few days hiking some of the trails and I left part of my heart in between the stunning mountain scenes and the adventurous paths. In this article I will share with you some cool shots I managed to capture and a bit of information on the best hikes around Pirin National Park. First things first. What should you know before you head to Bulgaria and Pirin Mountains? Pirin National Park covers the bigger part of Pirin Mountain, located at the southwestern part of the country. If you are looking for a starting point I strongly recommend Bansko – the most popular ski resort in Bulgaria. Click here to learn more about Bansko and what to do there during the summer. Bansko is located only 150 km away from the capital city Sofia and there are various ways to get there – by car, by bus and even by train. Click here to read more about the train ride to Bansko. This is a National Park of great importance for the country. In 1983 it was added to the UNESCO World Heritage Sites. The territory that the park covers has been expanded a few times to ensure that the rich ecosystems, natural landscapes and fauna and flora are all preserved. Please remember that any National Park is a treasure and we should not leave anything behind except happy memories. We can enjoy and admire the nature and its phenomena while still conserving it and leaving it unspoiled. And here we are – my top 5 hikes in Pirin National Park. Vihren is the highest peak in Pirin Mountain and the second highest in Bulgaria at 2,914 metres. I would not recommend this trail if this will be one of your first hikes. Vihren is known for being one of the hardest peaks to climb, but believe me it is totally worth it. The main and easiest trail starts from the southern part. The path starts from Vihren Hut located at 1950 meters altitude and takes approximately 3 hours to the top. You can get to the hut by car and leave it at the free parking just in front of the hut. The first half of the trail is not difficult at all as long as you keep a good steady pace. As this is a very rocky mountain, there are no forests on the way to the top. However, you will be able to enjoy spectacular views of the steep mountain ranges surrounding you. The last part to the top is the most challenging one as the trail disappears in between the rocks and everyone finds their way as they feel best. The views from the peak are even more impressive. Make sure that you spend a good few minutes in silence just admiring the beautiful scenery. In the distance, you will be able to see the other mountain summits of Pirin Mountain. If you want to challenge yourself more and get some adrenaline rush, choose the northern trail for the way down. As the peak is slightly steeper on this site, there is a metal chain to help you. I absolutely loved this part as I really enjoy adventurous things and I was slightly disappointed when we had already reached the wider part of the trail. The rest of the hike back down to Vihren Hut is relatively easy. We had a few more challenging moments when some of the parts of the route were still covered in snow (yes in July there was snow), which however, had transformed into ice and were a bit dangerous and slippery. We were forced to make a detour through some extremely steep rocky parts and I found myself almost lying on top of some rocks in order not to fall. For this reason I strongly recommend having hiking gloves in your backpack as you might need them! Make sure that you stop by the area named the Caldrons, which is just at the foothill of the peak. You can take a short break there while enjoying the breathtaking view of the Snezhnika glacier. 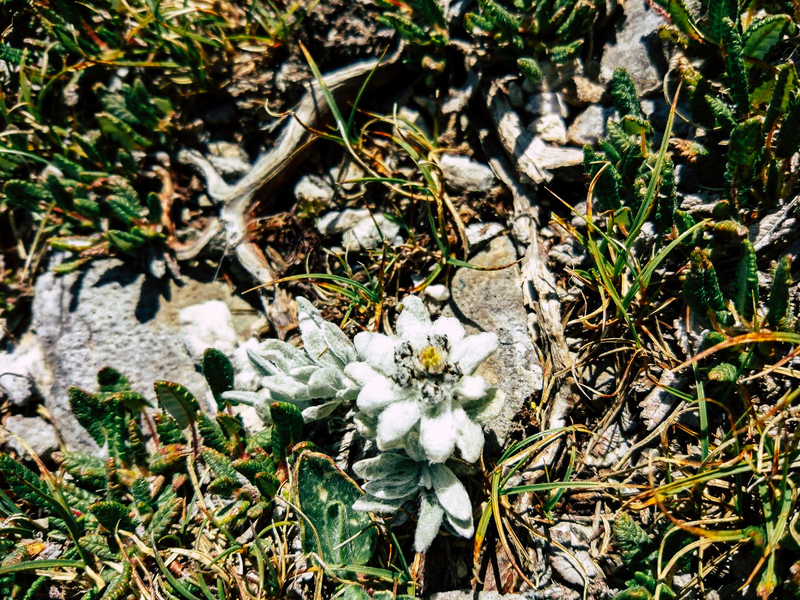 This is also the spot where you can find some tiny Edelweiss flowers hidden between the rocks. Please remember that the edelweiss is a protected flower and in Bulgaria it is included in the Red Book of Bulgaria of endangered species. The trail to get to Bezbog Peak is much easier than the one to Vihren. The hike starts from the beautiful Bezbog Lake and chalet. There is a chairlift from Goce Delvchev hut to Bezbog chalet, which runs all day from 08:00 until 17:00 in the summer. The return ticket price is 18 Bulgarian Leva. Funny enough, exactly when we were visiting the lift was closed for two weeks for maintenance reasons, and instead they took us to the hut with a jeep as an off-roading adventure. I should mention that Bezbog in Bulgarian means “without God”. I have absolutely no desire to get in the topic of the (none)existence of God, but this hike is so picturesque and scenic that you might think you are in heaven. This glacial lake covers an area of 19 acres and is 7 meters deep, located at 2,239 meters. Bezbog Lake is also the starting point for the Peak. The trail takes approximately an hour and 30 minutes and is extremely easy. There is only one steeper part at the beginning of the hike. Once you pass it though, you will know it is worth it. The view of the Bezblog lake and the chalet in the distance is absolutely spectacular. Make sure that you stop there for a few minutes and enjoy the scenery. The peak is located at 2,645 meters and easily reachable. This is one of the trails around Pirin National Park, which is not very well marked. I would advise getting a map of the mountain region if you would like to explore the hiking trails in this area of Pirin Mountain. If you feel that the route from Bezbog Lake to the peak is too short for you and you would like to hike some more, I would suggest going straight from Bezbog to Polezhan. Polezhan is a granite peak, compared to Vihren (which is marble) and is the fourth highest in the Pirin Mountain at 2,851 meters. The hike between the two peaks is slightly difficult. There is a ridge that connects the two peaks. The trail to Polezhan is slightly more rocky and unsafe, but don’t get scared – nothing impossible! From Polezhan, you will be able to enjoy even more awe-inspiring mountain views. The sheer granite peaks in the distance hidden behind thick and gray layers of clouds. As the clouds float, they spread out and form a spooky fog. Small blue glacier lakes lie underneath the mountain summit. The marble rocks are covered with snow patches all year round. As you are standing on top of this peak, take a minute or two to appreciate the natural beauty and soak in the moment of quiet and freedom. Note: Another option for a hiking trail is from Bezbog Hut to Popovo Lake, which takes less than 2 hours. Unfortunately, this year I was only able to see the lake from a far – enjoy its blueness beauty as hiking up the Polezhan Peak. I certainly have Popovo Lake on my list for next year, which means I will update you with more details about this trail next year! The hike to Muratovo Lake is one of the easiest and most beautiful hiking trails in Pirin National Park. It takes approximately one hour from Vihren Hut, but I strongly recommend taking this route slow in order to be able to enjoy the spectacular views along the way. If you are into photography, you would certainly want to take some photos as you are hiking up. This is a relatively flat and wide mountain route, which goes along the small speedy river. The steep part of the hike is at the end just before you reach the beautiful lake at 2230 meters. You will be impressed even with the first glance you take of the lake. The reflection of the surrounding mountain summits in the crystal clear water of the glacier lake is a truly outstanding view. The green grass, the fresh air and the ice cold water make this the perfect spot to take a long break after the hike. Baikushev’s Pine is one of the oldest trees in the world and Bulgarian’s oldest coniferous tree. The tree is about 1300 years old, discovered 130 years ago and named of the person who found it a Bulgarian botanist. The tree is 26 meters in height and 2.2. meter in diameter and it is just next to the small road between Banderitsa and Vihren Huts. I wouldn’t really classify this as a hike, because in reality most people just drive by the tree, stop for a few minutes and climb up the wooden stairs to get closer to the tree. Even though that this is not the traditional mountainous route, I would still recommend stopping by the Baikushev’s Pine, as it will give you even a better feeling and understanding of the significant of the Pirin National Park. I have to admit that this year was my first year hiking around Pirin National Park. Pirin in reality might be rocky and rough, but it is also peaceful, beautiful and quiet. The crystal clear glacier lakes, the marble summits, the flawless nature beauty, the breathtaking sceneries will make you fall in love with Pirin Mountains. Once been to Pirin National Park you will want to come back again. I myself am going back next year for even more adventures hikes – Koncheto (“The Small Horse”) and Djangala Peak. So, I will be coming up with an updated list of the best hikes in Pirin National Park. At the meantime, did you get inspired to visit Pirin Mountain? Does any of these hikes sound like something you would be interested in? Or you have already hiked around the Pirin National Park? If so, did you enjoy it and which were your favourite hiking trails? Share in the comments section below!